Most Americans, including policy makers, and Vietnam Veterans have expressed their lack of knowledge of Vietnam’s history and culture before US’s involvement in Vietnam to fight a war over ideology. The War cost over 58,000 American lives and claimed the lives of over a quarter of a million South Vietnamese soldiers, over a million of North Vietnamese troops and an estimated 7 million civilians from both North and South Vietnam. The war was over, but the misunderstandings continued. What can we learn from this war? 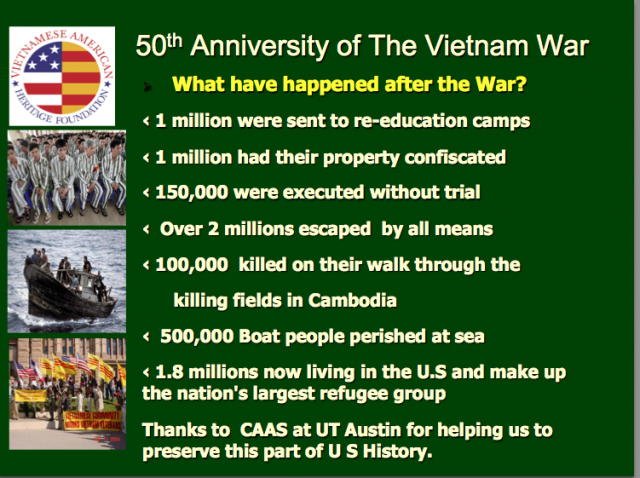 Perhaps, we may want to look at the war from the Vietnamese perspective. After all, we carry the largest cost of the war and suffered unspeakable atrocities long before and long after America’s involvement. The outcome of the War has affected us tremendously and the ongoing process of healing will take us generations. On May 8, 1965, 3,500 U.S Marines landed in Da Nang, a beach town North of South Vietnam. It marked the year America officially got involved in The Vietnam War by sending ground troops. However, for the Vietnamese, the war had started many years before. After World War II, Ho Chi Minh, an expat who was away from Vietnam for over 30 years, introduced communism into Vietnam. 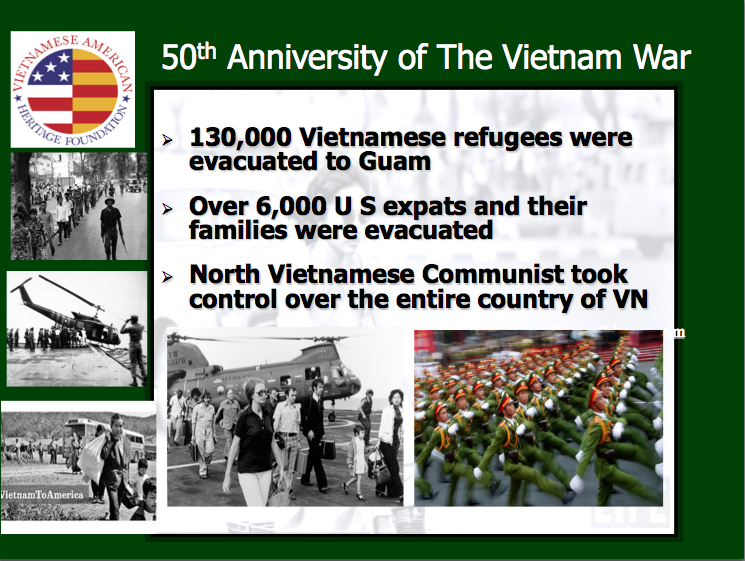 The Vietnamese have had a history of fighting for our sovereignty long before communism arrived. Our people fought the French for our independence from 1885, and we quickly had to fight another war against communists at the same time. 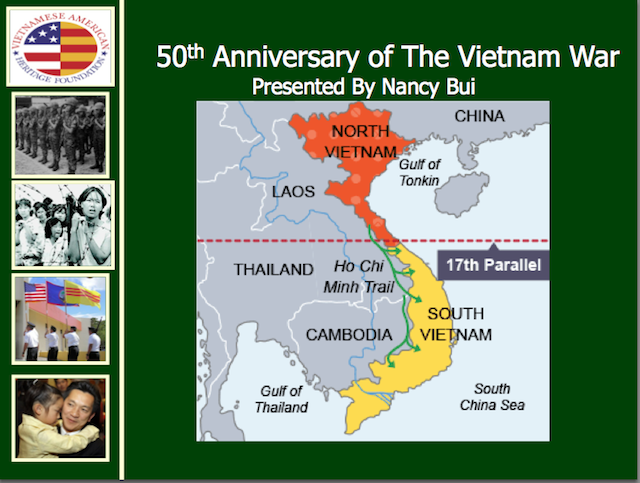 In 1954, the Geneva Accords was signed to divide Vietnam into two parts at the 17th parallel. The North belonged to the communist party, and the South belonged to the free Vietnamese. 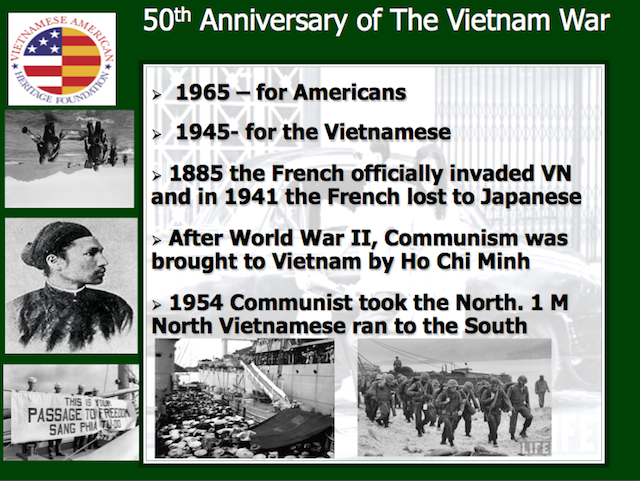 On May 19, 1959, Ho Chi Minh’s 69th birthday, with help from Russia and China, North Vietnam officially kicked off the invasion of South Vietnam. The South fought back in a Guerrilla War which lasted from 1959-1963. America wanted to end the war as quickly as possible and sent troops to Vietnam. President Ngo Dinh Diem on the other hand, only wanted economic aid, weapons, and training, because he believed that any foreign troops on Vietnamese soil would sooner or later offend the Vietnamese people, as fighting for their sovereignty from foreign invaders was their way of life. The conflict ended in his assassination on Nov. 2, 1963. 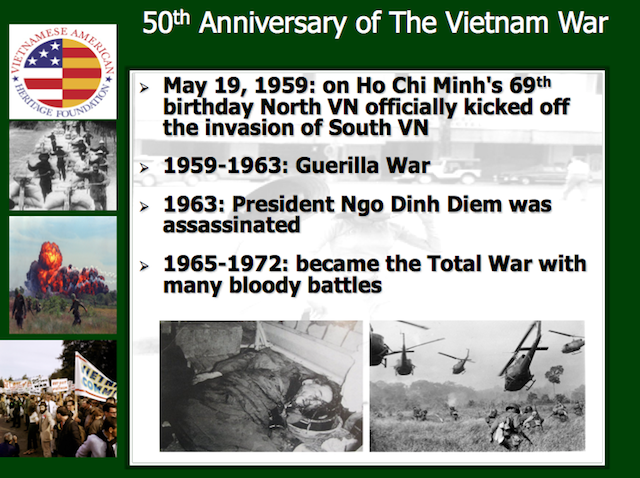 After sending troops to Vietnam, the conflict extended into a Total War. The battlefields became bloodier and bloodier. Over half a million U.S troops were in South Vietnam by 1968. Vietnam lost the media war, as public opinion and support for the War rapidly declined, triggering a decade of antiwar demonstrations. America started pulling troops out of Vietnam. By the end of 1972, all combat troops were completely withdrawn. 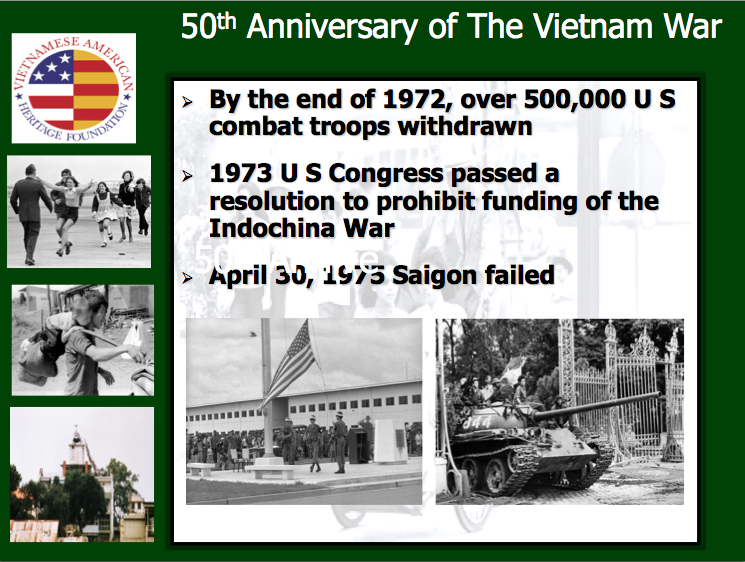 In early 1973, Congress passed the resolution to prohibit any funding of The Indochina War. The US was quick to get involved in the war, but was even quicker to retreat from it. The South Vietnamese Army fought for over two years without any outside assistance. On the other hand, Russia and China more than doubled their aids to North Vietnam. The South fought to their last bullet and finally surrendered on April 30, 1975. The following two slides offer further information what happened after the war. Mark Lawrence’s article The War in Vietnam Revisted and his recommended must-read books on the war in Vietnam.